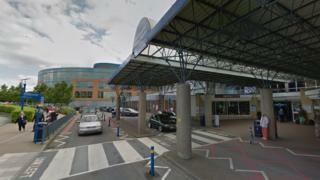 Hospital security staff in Southampton are to walk out on Friday in a dispute about pay and safety. Mitie Security workers, who are represented by Unite the union, say they face attacks from the public at Southampton General Hospital. Mitie said Unite had rejected an offer of a pay increase to £9.50 an hour and increased sick leave for injuries sustained at work. Unite said not enough progress had been made to call off Friday's strike. The union said staff had been subjected to regular attacks by members of the public under the influence of drink and drugs. Mitie said its latest pay offer equated to a 14.5% increase in the last seven months. It said it had also offered four weeks full sick pay and four weeks half pay for injuries sustained while at work, which is "double the time currently offered". A spokesman said: "Unfortunately, Unite has chosen to reject this offer. "Ensuring the safety of patients and members of the public visiting the hospital remains paramount. "During the strike action, we have arranged for a fully trained team of officers with relevant experience to provide cover onsite to maintain a usual level of service."